Crystal cruises executive chefs have spent four years developing new innovative menus for Crystal Symphony and Crystal Serenity. The redesign was led by Crystal Cruises' Vice President of Hotel Procurement and Food and Beverage Operations, Toni Neumeister, and will earn the luxury cruise line Michelin-level envy. Bringing in experts (including former Fat Duck Executive and Research and Development chef Kyle Connaughton), the culinary redesign took more than three years of research and development, plus sourcing, purchasing and redesigning of onboard spaces. Another year was spent in training, conceptualising and holding "menu summits" onboard to create the new programme. Using state-of-the-art techniques and high tech galley equipment, the new cuisine features more than 100 new dishes showcasing modern epicurean artistry. 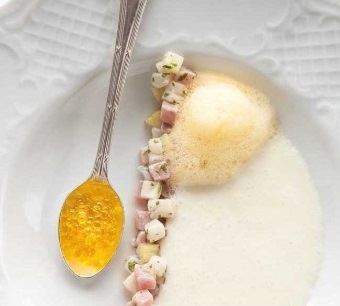 With these tools and skills, chefs can now transform lemons into sugar-like "snow", raspberries into noodle-like ribbons, spinach and beetroot into pea-shaped balls and lobster essence into an airy foam, without losing the flavours or textures that make the ingredients so mouth-watering. No less important in Crystal's new dining adventure is the presentation of dishes. All modern dishes are artfully arranged using gels, foams, crystals, innovative colours, unexpected geometric shapes and other innovative methodology that creates an extra-sensory, epicurean experience of awe and delight. Liquids are transformed into solids. Ice cream is heat-resistant. 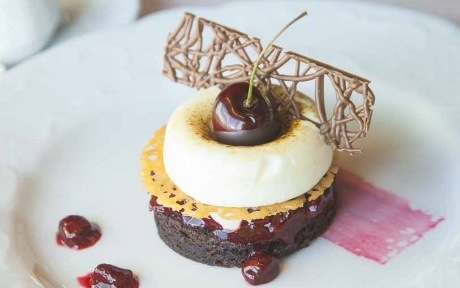 An intricate web of chocolate seemingly defies gravity perched on top of contrasting layers of textures and flavours in a deconstructed Black Forest cake. It's an experience one really needs to see and taste to believe. 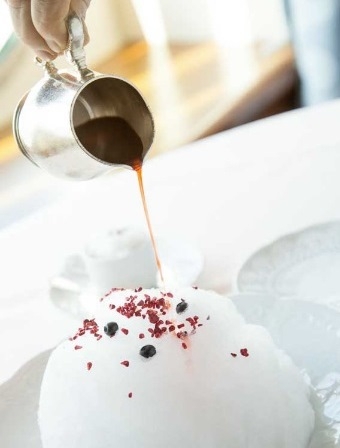 Strawberries Romanoff - comprising of a dome made from candy floss that immediately melts when the strawberry consommé is poured over it, revealing a berry-almond cake with vanilla anglaise underneath. Scallop and tuna tartare with flavoured citrus foam, white miso soup poured over and olive oil "caviar" balls that explode with cold flavour when bitten into. Toni Neumeister says. "We're excited, our guests are excited and the overall value of our efforts is priceless - literally price-less. Even for the world's biggest foodies, a dinner of this calibre might be something they do once a week at a cost of hundreds of dollars. On Crystal Cruises, one can indulge in cutting-edge culinary exploration every single night while they also explore the world-all for no extra charge." The new menus and dishes are now being served in the Crystal Dining Rooms of Crystal Symphony and Crystal Serenity, all complimentary of course.